This week I hit quite a score. 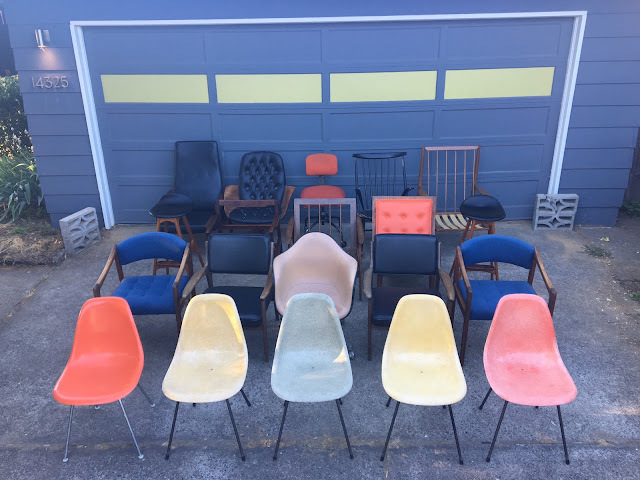 20 chairs in one day! Some of the chairs have already made their way into Hawthorne Vintage. We are working quite diligently on the rest. We are looking forward to restoring all of these wonderful chairs. Here is a closer look at a few of the pieces. We are always on the hunt for wood frame lounge chairs. It had been a while since we have had any. This Eames armshell chair has hard to find reclining caster base. The shell is damaged beyond repair but I will save the base and wait to find a nice shell for it. Rocking chairs are our favorite chairs. Yes, this Illum Wikkelso rocking chair was produced with black paint. It will be available once we get a fresh coat of black paint on it.